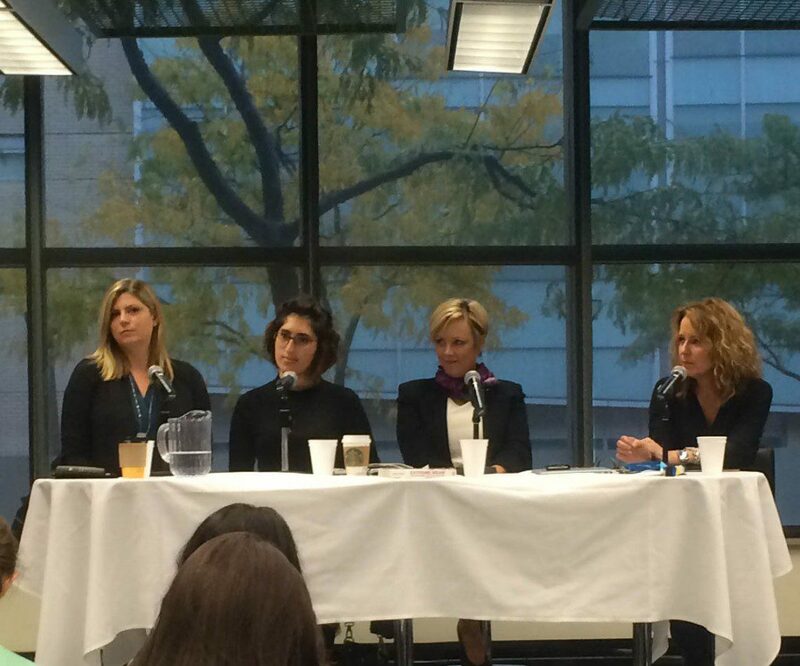 The harassment of reporters online and during live television hits can have personal consequences for women in the field and affect their careers, veterans of the troll wars said during a panel discussion hosted by the Ryerson Journalism Research Centre. Harassment – both online and off – most often targets female journalists and raises concerns about their safety on the job, author and journalist Paula Todd told a room packed with journalism students during the Oct. 28 event. This in turn, she warned, may make producers hesitant about sending women out to do live broadcasts at all. Fellow panelist and CityNews reporter Shauna Hunt knows all too well how harassment interferes with her ability to do her job. Since it was popularized by several online videos in 2014, she and other women journalists across North America have had the phrase “f**k her right in the p***y” (known by the acronym FHRITP) yelled at them by passersby while they are trying to film live hits. Hunt said she has been interrupted by children, men in business suits and drivers who roll down their windows to shout the obscenity as they pass by. Reporters at her station, she said, have tried to cope by using noise cancellation equipment and repositioning the camera in quieter areas where there are fewer people. In the latter case, filming away from the crowd is at odds with the whole point of doing a live hit, which is to be in the middle of the action. Hunt’s decision to confront men who interrupted her when she was covering Toronto FC’s home opener in May went viral after CityNews aired the footage. The video now has more than 5,400,000 views on YouTube. Interrupting women while they are doing their jobs is not a harmless prank as some have argued, said Todd, whose book, Extreme Mean: Ending Cyberabuse at Work, School and Home, examines why people – often men – choose to demean, stalk and threaten others. Harassment, whether it is online or in the field, is not free speech, Todd said, noting that in fact it can stifle free speech by silencing women’s voices and making people afraid. Indeed panelist Hana Shafi said online trolls forced her off the Internet for two months. Shafi often writes about social justice issues and controversial topics and she says this draws the ire of those who don’t like her challenging the status quo. Instead of simply disagreeing with her opinions, she said she gets “hundreds” of messages from online trolls hurling insults, slurs and threats. In her first year as a journalist, the online harassment worsened to the point where Shafi said she began to question why she’d ever gone into the field. Eventually, though, it was her love of writing that brought her back onto the Internet. While she said she doesn’t respond to trolls and just blocks them, she does get screenshots of their tweets, posts and messages and shares them on Twitter as proof of what she deals with.